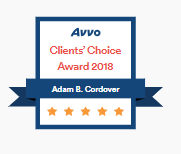 Collaborative family law attorney and Florida Supreme Court Certified Family Law Mediator Adam B. Cordover received the 2018 Avvo Client Choice Award. The Award is provided to attorneys who receive five or more 4+ Stars in a calendar year (all Adam’s reviews have been five out of five stars). Adam was and still has been a tremendous resource to me with my tumultuous divorce process. He was honest and fair – he put me in my place when I got too riled up during the process and provided me a real picture of what needed to be done – and what the potential outcomes could be. Adam was not an attorney that billed crazy hours and prolonged the case – he was steadfast and eager to help me – he did not ever drag things out like a lot of attorneys do just for some extra billing. My case ended – and even after we had completed our business relationship, Adam continues to demonstrate his compassion towards me and my challenges with living as a divorced single father – not for the money – he seems to do it because he has taken ownership of my post-divorce challenges at times. I highly recommend anyone going through a divorce to speak to Adam first about a collaborative approach to marriage termination – as well as all family legal matters. While no one wants to face the challenges or realities that come with divorce, Adam will show you the truth before anyone else knows it – and help you plan for your future. Posted by Kenneth on Avvo. Adam and his team were excellent. Guided me through the collaborative process. Posted by Robert on Avvo. I was nervous and going through a horrible separation. Adam made me feel very comfortable and answered all my questions with confidence. I just needed him for a consult but if I need him I will definitely hire him to be by my side. Posted by Kimberly on Avvo. Adam was a great help consulting both my wife and I through our divorce. He presented different ideas on how we could go about separating our items and property. He also completed the needed paperwork for the court hearing. Thank you very much for the help! I would absolutely hire Adam again. Posted by Shawn on Avvo. Note – In this matter, Adam Cordover served as a neutral mediator, not as an attorney. I’m very pleased with the job Mr. Cordover did for me. I needed correction on my birth certificate and he went through the steps with me of all the things that needed to be done. Mr. Cordover told me that the process would take from six to eight weeks, and the case was closed in a month. Jennifer his assistant is very knowledgeable on what she does, so the process ran smooth from beginning to end. I would recommend Mr. Cordover to any person whose in need of an attorney. I search for the lawyer at a different county, but it was worth it. Posted by Anonymous on Avvo. Adam B. Cordover is a collaborative attorney, American Bar Association Author, collaborative trainer, and Florida Supreme Court Certified Family Law Mediator. Video: CPA Discusses Collaborative Divorce Divorce: Who Gets The House?